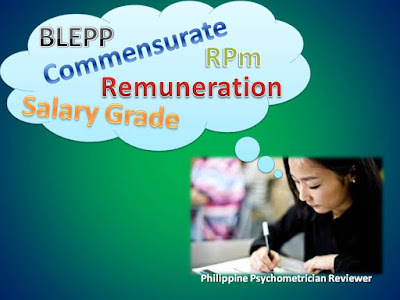 Philippine Psychometricians Licensure Exam Reviewer : Why take the Psychometrician Exam? I have one question in mind tonight as I ponder on my career options. WHY TAKE THE PSYCHOMETRICIAN EXAM? This question is not limited to those who will be taking the exam this year. In fact, this goes to everyone in the Philippine psychology community. And along with this question is a ripple of other questions. I am a licensed psychometrician (RPm). I am currently working as a job order records clerk for the HR's office at a local hospital. At PhP 225.00 a day, I make my job worthwhile by telling myself I will have opportunities opened soon. After all, I am a psychometrician and a professional civil servant (took the exam way before RA 10029). Right? well, reality check? Not really. As my job would have it, I've had the chance to see nurses fresh from their licensure examinations get hired. Nurse 1, Salary grade 11, basic pay PhP 18,549. And thanks to the recent Senate Bill 2583, entry level nurses will soon be at salary grade 15, a relatively impressive PhP 24,887. Even job order medical technologists are at an advantage at PhP 295 a day. When they get hired as Med tech 1, they are on same level with our nurses at salary grade 11. The same goes with the rest of our professionals: radiology technologists, pharmacists, social workers, the list goes on. Even midwives who finish a 3-year course get hired at salary grade 6, PhP 12,921. No intention to downgrade the said professions, but there is some envy at work here. I couldn't help but feel for our profession. Consider this, when I took the exam one of my co-examinees had a bout of nausea. The proctors went on to aid him. And as things were clearing up and the test administrator was walking back to her post, I overheard her say and let me just translate it, "How could you faint with such an easy exam?" This is the onlooker's point of view. Not to be conceited, but of course, anyone who'd taken the test will attest to its difficulty. The point is, society's regard of our profession is low. And it's not just society, the provisions on the practice of psychometry is narrow and limited. In accordance with Sec. 3 (d), Article III of R.A. No. 10029, a psychometrician is authorized to do any of the activities specified in the section; Provided, that these activities shall at all times be conducted under the supervision of a licensed professional psychologist. Fine and well if you live in an urbanized area with a flow of psychologists to work with, but more often than not it is quite difficult to find work. Especially one that follows the salary standardization law. Hopes are high because, finally, psychological tests are gradually becoming in demand in government institutions such as in the hospital I work for. Imagine my excitement when the administration decided to open a psychological facility. But then again I checked the job opening and it was only for psychologists. Yes, i may be reassigned to the facility as a psychometrician (that is IF they find a psychologist in this remote island far away), but there is no such plantilla for that. Still, I'll be on a job order status. And by the way psychologist 1 is salary grade 11. Note that these are professionals with a master's degree or maybe a Ph.D. Someone must push for the standardization of this profession. This is the current reality of our profession, at least in my point of view. RN's can be nurses, RMT's can be Medical Technologists and so on; duly registered professionals have all the opportunity to practice their craft. Here's to hoping someday we, as psychometricians, can level up to their status. As for me maybe I'd be on a job order basis for the rest of my career despite of all my sacrifices just to to take the exam. Unless I drift off to some other career other than psychometry. Maybe there others like me too. I am sharing this so that we can push for a standardization law for our profession, when we don't need to ask why we should take the exam, where RPm's can be psychometricians.